Soapbox Science is a series of annual public science communication events that bring cutting-edge science to the public, in an accessible, fun, free and un-intimidating way. Unlike other science events, a ‘Soapbox’ audience will not have necessarily planned to come and learn about science – rather, they happen across a bunch of world-class scientists as they stroll down the streets! Because of this, the event is unique among science outreach ventures, in that it has the potential to inspire people who never normally get exposed to science. Moreover, it is accessible to anyone, irrespective of education or financial means. Finally, there cannot be a more ‘green’ and sustainable way of disseminating science and engaging with the public: there are no expensive exhibits, constructions, pavilions, props or speaker fees; it is highly portable, reproducible, and flexible in its theme. Soapbox Science is a next-generation science event: it is a sustainable, cost-effective, non-discriminatory approach to bringing science to the people. 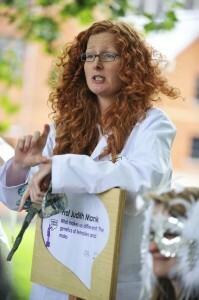 Soapbox Science runs for 3 hours over an afternoon in public. The event is divided into one-hour sessions, with 4 speakers per session. Speakers stand on custom made “Soapbox Science” soapboxes, arranged in a semi-circle, facing slightly inwards, to facilitate the crowd’s movements. Our events enjoy substantial media coverage, including BBC, The Guardian, Time Out, The Times. We also receive great interest from the scientific community, with coverage in Nature, Science and New Scientist. Soapbox Science uses an inclusive definition of “woman” and “female” and we welcome speaker applications from trans women, genderqueer women, and non-binary people who for the purpose of this event feel comfortable being female-identified.